← Dancing Light Circles on The Clouds. 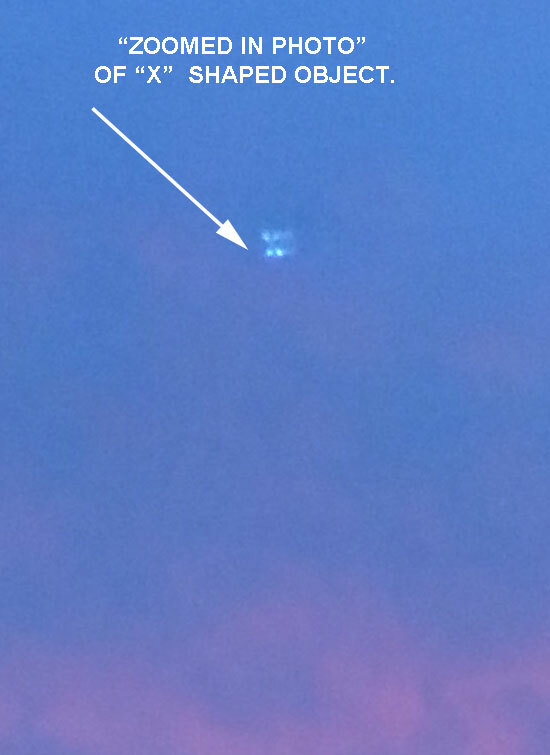 Glowing X Shaped Object With Trail Behind Photographed. ZOOMED IN IMAGE OF X SHAPED OBJECT. 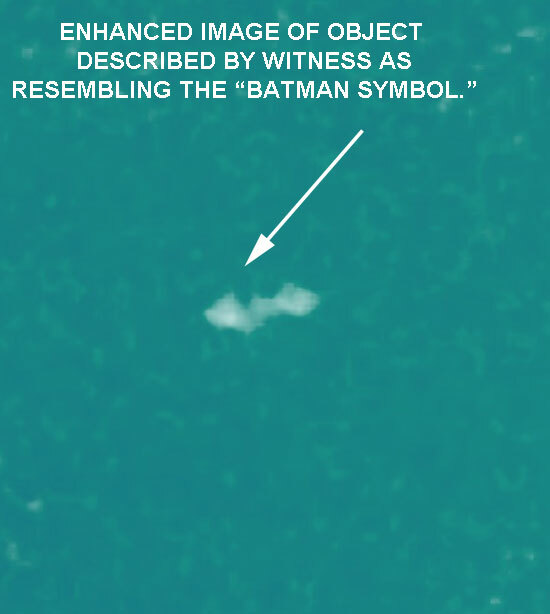 ENHANCED IMAGE OF BATMAN SYMBOL OBJECT. Description: After examining a photo of a sunset I had taken, I noticed two unnatural looking objects in the sky. Further investigation revealed the first object to be an ‘X’ shaped object that seemed to be glowing. It looks as if there is a faint trail behind it as if it may have been moving. The first image is the unedited original. The second is the same unedited photo zoomed in. Related to the ‘X’ shape object (X-Craft) previously reported, this object was more faint and distant. The only describable shape to my knowledge, as silly as it sounds, is the Batman symbol. Obviously this is the only earthly comparison I have and do not think the two are related in any way. The shape seems unnatural and I find it odd that it was in the background of the photo of the ‘X-Craft’ from my previous report. The first image is the same unedited original of the ‘X-Craft’ (image currently reporting found above and to the right of the ‘X-Craft’). The second is a zoomed photo with added filters to provide clarity of it’s shape. This entry was posted in Discovered anomaly in photo, Lens Flare, Photos, Possible reflection, Strange Shaped, UFO Sightings 2017, UFO sightings Alabama, X shaped and tagged Glowing. Bookmark the permalink. 2 Responses to Glowing X Shaped Object With Trail Behind Photographed. Any time you point a camera towards the sun, expect optical artifacts. I would chalk this up to optical flares or reflections. Yes, I classified this report as lens flare or possible reflections using WordPress tags.